In the 1980's, Canada's then Museum of Man needed a player to transcribe a collection of wax cylinders of great anthropological interest. The challenge was taken up by Fred Granger at the Technical Services of the National Museums of Canada. 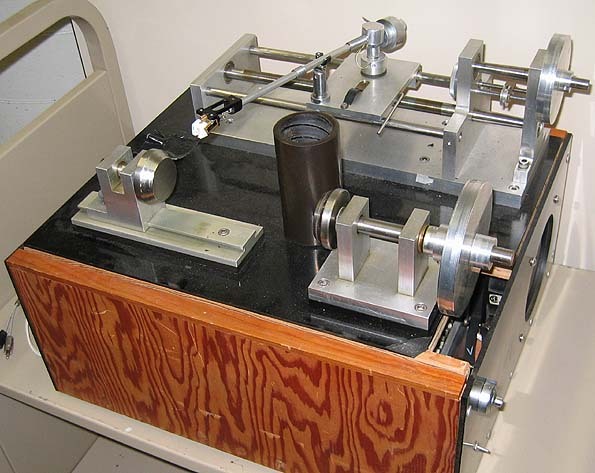 The way to the present player was not short or straight, or as Fred himself puts it "at the time that the machine was built, we had little reference to other efforts and had to go through a variety of mechanical assemblies. These were cannibalized from old wax cylinder players that were discarded from the museum. Using the measurements and observations, some of the design objectives were implemented into the new machine." 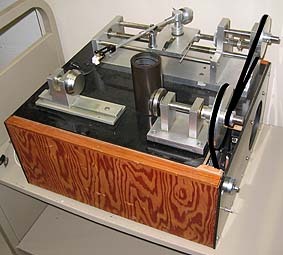 Fred made the drawings and the machine itself was built at the Physics Labs of the National Research Council. It still stands in the Museum of Man, now called the Canadian Museum of Civilization, located in Gatineau, Quebec. It is a piece of heavy engineering and it rather resembles a lathe in one of its particularities: the way the wax cylinder is attached to the player, by being fixed between a spindle and a tailstock rather than by being thread onto one conical mandrel. 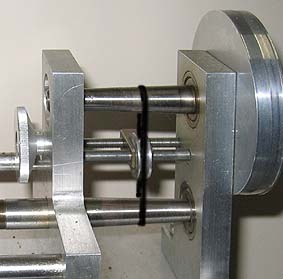 In the image above, we see the player without belts on the pulleys, with the tailstock moved to the left to release the cylinder, and the cylinder itself standing on the player. The tonearm looks like a fairly standard construction from a gramophone. It has been modified so that the pickup extends in the direction of the tonearm and not at an angle, as is the case on gramophones. The arm is mounted on a plate which is moved by a variable speed feedscrew to follow the advancing groove on the cylinder. Any imperfection in advance speed will be taken up by tonearm swivel. The player contains no preamplifier. Another particularity about this player is that is has double speed regulation, one electric, via a potentiometer to the right on the box, and one mechanical, by belt and tapers right on the feedscrew. 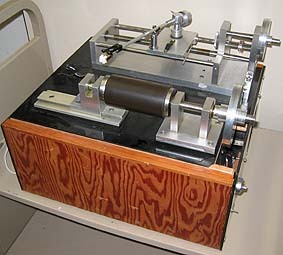 Once completed, the player was used to transfer the sound of some 1700 cylinders in the collections to magnetic tape. In this picture, which is really the same as the larger picture above, I have drawn in the two drive belts, the one coming up from the motor below the baseboard, and the one continuing to the feedscrew drive pulley. Here, the cylinder is on the "lathe" and the tailstock has been moved to the right to secure it in place. Closeup of the tailstock showing at left the spring that applies a fixed amount of pressure to the cylinder. Closeup of the plate carrying the tonearm. 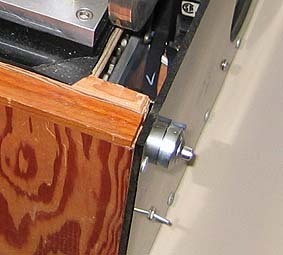 Under the black spring there is a half nut that engages the feedscrew when lowered (as in this picture). In order to move the plate back to the starting point for playing a cylinder (i.e. 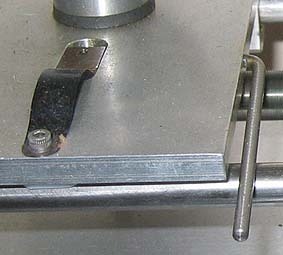 to the right), the lever on the right side of the plate is raised, lifting the half nut off the feedscrew. Shown here is the speed control, consisting of two tapered axles. The upper one, connected to the drive pulley, tapers to the left, the lower one, which continues to the left in the form of a feedscrew, tapers to the right. In the same image I have drawn in the belt connecting the axles. 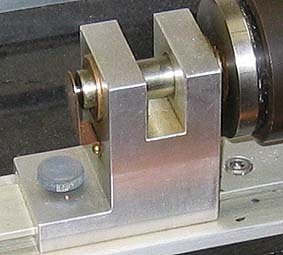 For a change in speed, the knurled knob at left is turned, moving the small central pulley sideways, and with it the belt. This mechanism would probably be quite noisy. 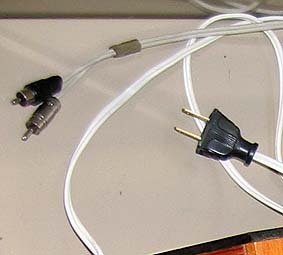 Connections are what we might expect: American plug for 110 volts power, and RCA phono plugs for sound out. In this image, we get a glimpse down into the box. On the outside of the box we can see the single-turn potentiometer for speed regulation and below it the on-off switch. Thanks to Henri Chamoux for sending me the pictures and indeed making me aware of the existence of this player, to Bill Klinger and Richard Green for finding Fred Granger, and to Fred himself for answering everybody's questions.